That’s right, Doodleworlds, the colouring book, is now available on Amazon.com as well as the other Amazon websites, so now all the lovely, wonderful colourists who love my work can join in with the fun of this book! First work in progress (WIP) for this Wednesday is the Doodleworlds colouring book. It is currently in the last phases of approval and proofing at CreateSpace.com, so it should be ready to purchase soon! There will be a pdf version available on Etsy at the same time. The coloured cover art on the front and back covers has been done by the winners of the contest run in the facebook group Angela Porter’s Coloring Book Fans. Congratulations to them, and thank you for your work as well! 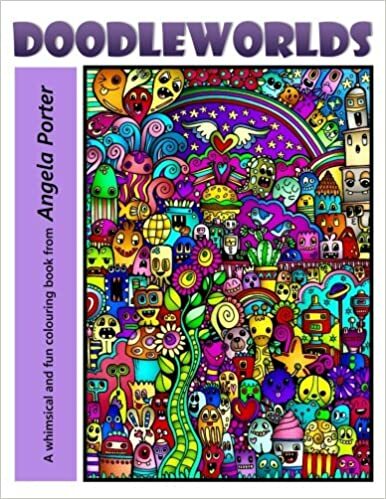 WIP Wednesday is a weekly event in the Angela Porter’s Coloring Book Fans facebook group, so pop on over if you’d like to join a whole heap of lovely, creative, friendly coloring fans!